What if it's more beautiful than we imagine? Water has always been a place of joy and life for me. I loved to swim as a kid. I felt at home and free in the water in a way that I did few other places. I remember the pool in the apartment complex where my mom and I lived before I was in Kindergarten. I remember my mamaw and papaw’s pond. My cousins and I could not wait to jump in the water despite the occasional water moccasin or snapping turtle. We didn’t care. My mamaw—a biology teacher and ardent nature lover—always assured us that our splashing would keep anything dangerous away. And she was right. I remember my mimi’s fancy country club pool, too. I would stay as long as the grown ups would let me—jumping off the diving board, doing the ‘Nestea Plunge,’ summersaulting underwater, trying to swim the length of the pool without coming up for air. I remember sleeping over at her house one summer not long after I’d become part of her family. She promised we could go swimming first thing the next morning. I put on my swimsuit before breakfast and tried to pass the time until she was up. When I couldn’t wait a minute longer, I went into her room to see if she was ready to go. It was around four in the morning. And there was a TV show I loooved called Man from Atlantis. 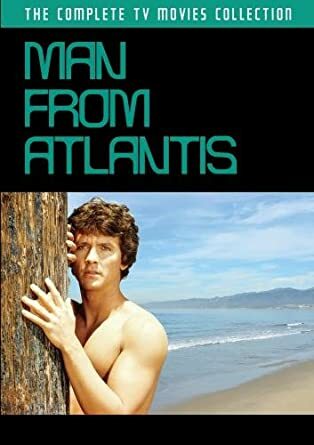 Patrick Duffy (Bobby from Dallas) played an amnesiac survivor from the ancient culture. Which is super plausible obviously. He could breathe underwater and his hands and feet were webbed. I remember swimming in the water’s blue shadows, imitating the way the (mer)man swam. As I’ve gotten older, I still love swimming and kayaking and paddle boarding even though I’m maybe a little less excited about putting a bathing suit on. And I still love even being near water. There is something healing about it for me. Moving to where I can see the lake from our windows has been an incredible gift. All to say, I’ve always felt a little sad and confused when I read the bit about the new earth in which there was no longer any sea (Revelation 21.1). I always wondered why Paradise was going to be missing something that represented much that was wonderful and mysterious and playful in my world. If you didn’t grow up in an evangelical or fundamentalist church, I understand if you’re chuckling at the idea of this. I was taught to take the Bible very seriously and to read it literally. I still do the former though I’m learning to embrace the ways in which pictures are painted and metaphors are sometimes employed in its incredible pages. I’ve learned, for example, that the sea is connected in many ancient cultures with chaos and violence. Contemporaries of John would almost certainly have understood the missing sea as an ushering in of peace when it is referenced in his apocalypse rather than as signifying a literal absence of large bodies of water. Still, maybe the oceans really won't be part of eternity. If so, I trust it will be wonderful and somehow better. But what if heaven is full of good surprises? What if it’s more beautiful and fun and full of possibility than we’ve ever dreamed? Here’s what I saw in my mind’s eye. It swirling mass of colors—blues and greens of every hue. And the colors were alive somehow. I remember being struck by how beautiful it was. And then some of the brighter patches of green would begin to melt away, revealing another world. This world, I somehow knew, was more real than ours. I was aware of being at a high elevation. The sky was pale blue with a few feathery white clouds. The sun was high above and the quality of the light suggested a bracing winter day. This was nothing like any place I’d ever been in real life. When I looked down, I saw an expansive sea. There was a sliver of beach and a pier extending over it, inviting a stroll and legs dangled over the edge, toes splashing in cold water. I didn’t see anyone but somehow I didn’t feel alone. There was the idea of huge old-fashioned ships with billowing white sails just out of sight, about to arrive. The sun flickered on the seas so brightly my eyes sprang open. I expected to see sunlight reflecting on the studio walls. But the room was in shadow...the sense of light penetrating my closed eyes wasn’t physical. And the feeling of it all was that of a beautiful living veil, our everyday world, giving way to reveal a paradise that I wouldn’t have thought to imagine. George Fox once wrote “I saw also that there was an ocean of darkness and death, but an infinite ocean of light and love, which flowed over the ocean of darkness.” It was like that. When I think of paradise, I always tend to picture, stereotypically I admit, a lush garden with a flowing stream. It’s warm and full of vibrant colors. The idea of a cold, tonic sea was unlooked-for. But I was filled with a desire to share this world. It was full of brilliant light and strong joy and the best sort of mystery. It felt like heaven. It felt like a place both infinitely familiar and completely unexpected. I would like to go there. And I would like you to come with me. My mission is help people connect more deeply with God and themselves through compassionate presence and courageous love. Contact Terra to learn more or to make a spiritual direction appointment.